LG dryer displays an error code? 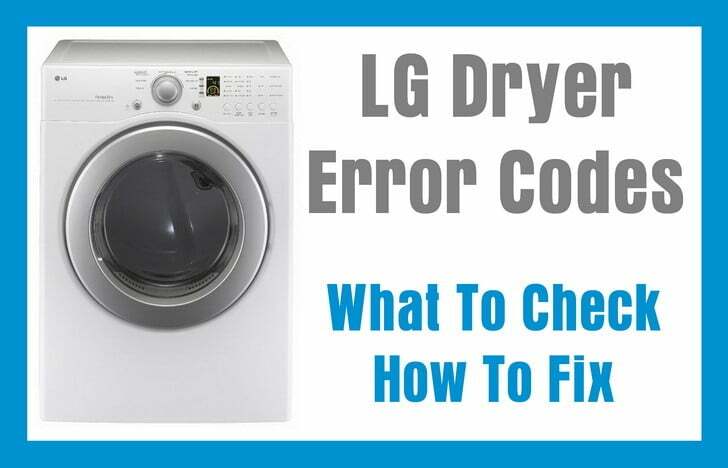 The error codes below will help you troubleshoot the problem with your LG dryer. These error codes can tell you what to check, repair, or replace. 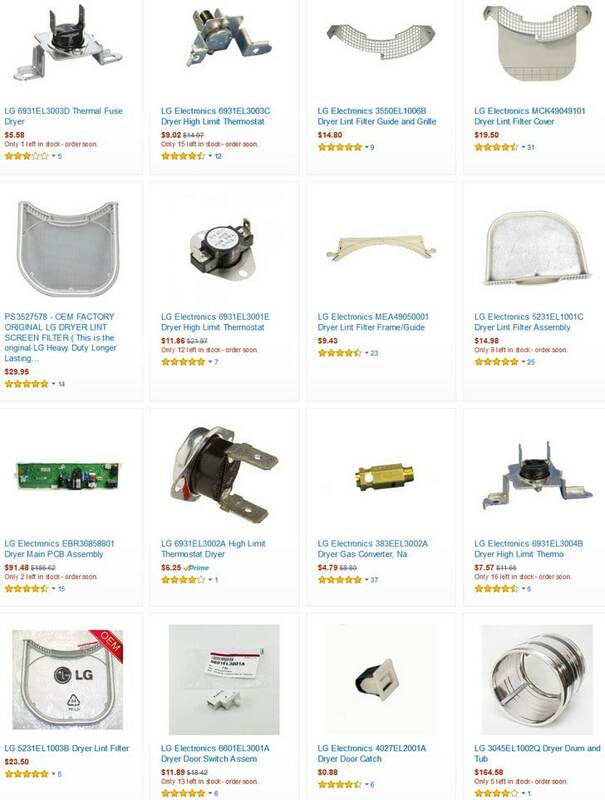 These error codes can help you to find the issue and fix your LG dryer yourself. Clean out air vent exhaust lines. Check and or Repair = Check that the lint filter is inserted properly. Check and or Repair = Be sure the white and red wire connections bare not reversed on the dryer’s terminal block. Check and or Repair = Press and hold the key labeled CHILD LOCK for 3 seconds to disable the Child Lock feature. Check and or Repair = The control detects the temperature sensor is defective. Remove power from the dryer and measure resistance through the thermistor. It should measure about 10,000 ohms. If the thermistor is defective then replace it. -Unplug the dryer, or trip the circuit breaker supplying power to the dryer. -While the dryer remains without power, press and hold the START/PAUSE button for 5 seconds. -Restore power to the dryer and try to run another cycle. Check and or Repair = Check that the drain hose is not kinked, twisted, or clogged with water at the end of the hose. -Press the START/PAUSE button to start the dryer again after checking that the drain hose is not kinked, twisted, or clogged. Check and or Repair = Check the operation of the door switch. Do this by using the diagnostic test mode. If the door switch is defective then it needs to be replaced. Check and or Repair = Clean the sensors on the inside of the dryer that are located below the lint filter. Allow the sensors to fully dry before attempting another cycle. Check and or Repair = Before using a steam cycle the steam feeder must be filled with water up to the MAX indicator lines. Check the steam feeder to be sure that it is full of water and that the drawer is completely closed. -Press PAUSE to temporarily stop the running cycle. -Fill the steam feeder with tap water to the MAX fill line. -Power the unit off and back on again, select the STEAM cycle, and press the START/PAUSE button to finish the cycle. If your LG dryer error code is not listed here, please leave a comment below and we will be happy to assist you with your issue. My LG Tru Steam dryer will not turn off. There is no error code (the screen is blank) and the dryer will only turn off when the door is opened. The dryer is not heating when it is running, the vent is clear. To stop the dryer the dryer must be unplugged. The tech is here and is stumped. What is a possible cause/remedy? The dryer is 1.5 to 2 years old. My code isn’t on this list. Please help! My code is F followed by 01. LG TROUBLESHOOTING AND ERROR CODE PAGE. LG. DLG2526W gas dryer error codes 1U02 and1898. Low or no heat. Help please! LG DRYER – What does a C mean? My dryer stops and there is a C on the display. LG Dryer won’t start at all. Heat won’t go up and down on any setting. Dryer LG sensor Dry 011531020182A091658 121R1163. Attempt to reset the LG Dryer by removing power for 10 minutes. I have an LG dryer number DLG5988W. My dryer spins but has no heat. I replace the igniter still no heat. The dryer is giving me a 19:FO. Please help with error code or part needed. Previous post: Samsung Dryer Error Codes – What To Check? – How To Clear?